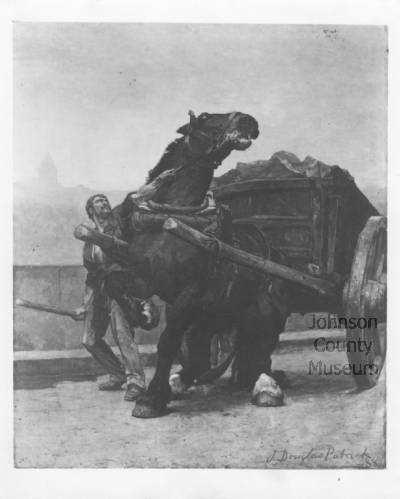 This is a print of a painting called “Brutality”, painted in 1888 by John Douglas Patrick, a local Johnson County resident. The original painting was 9 1/2′ by 11 1/2′. In 1889 the painting was entered in the Universal Exposition in Paris where it won the third place medal. Mr. Patrick was the first artist West of the Mississippi to ever be awarded a medal by the French Government. John Douglas Patrick was born in 1863 in Hopewell, Pennsylvania. In 1878 his parents moved to what is now Lenexa and bought 160 acres for $25.00/ acre. He attended nearby Valley View School. According to the American Legacy Gallery: At 17, he enrolled in art classes at the St. Louis School of Fine Arts and between 1885 and 1888 he studied in Paris at the Academie Julian. He then returned to America to teach at the St. Louis School of Art. In 1904, he began teaching at the Kansas City Art Association and School of Design (renamed the Kansas City Art Institute in 1920) and supplemented his teaching income with portrait commissions. Mr. Patrick died in 1937. “Brutality” and other of Mr. Patrick’s works are part of the Nelson-Atkins Museum of Art’s permanent collection, and were donated to the Museum by Grayce Patrick Wray and Hazel Patrick Rickenbacher, daughters of the artist.